Now, the problem is reduced to making a cut on a given edge pair, such that the cut splits the polygon into two sub-polygons of specific area. Say, we select edges AD, and BC in the 4-sided polygon shown below. Determine the angle bisector of the edge pair. This is dotted line, labelled as m in the figure below. Ignore the projected points that don't lie on the opposing line segment. 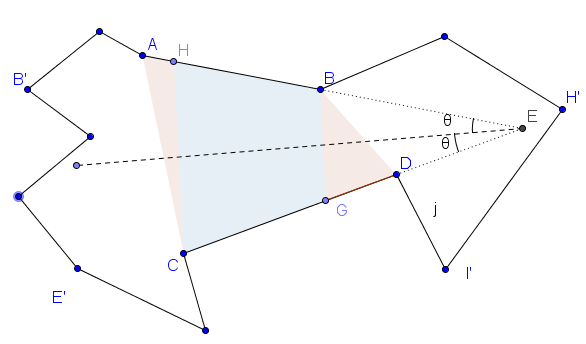 In the figure, the projected vertex of B is G, and D is H. The projection of point A along the line perpendicular to angle-bisector m doesn't lie on edge BC, so it is ignored. Same argument applies to the projection of point C. The valid projection points of the four vertices are , and . 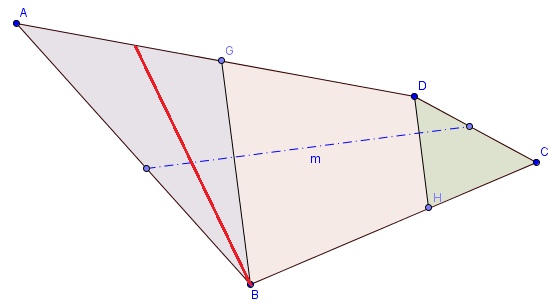 If the minimum cut lies in the trapezoid, then the two points of the split line (shown in red) can be found via linear interpolation based on the target area, similar to the approach we took for the triangle case above. In the case of triangle, one point of the split line was fixed as a vertex. In the case of trapezoid, both points of the red split line can move based on the area. However, the requirement that the split line needs to be minimum dictates that the angle of the split line must always be perpendicular to the angle-bisector of the edge pair. One end of the line will be the linear interpolation between points , and . The other end of the red line will be the linear interpolation between points , and . There may be several edge pairs that provide a potential split cut. We can compare them, and select the minimum cut. Special Case: For concave polygons, some of the cut lines found with above approach will be outside the polygon and/or intersect with existing edges. So we simply add an additional verification step to ensure that the split lines don't do so. If they do, then we ignore those split lines as a potential solution. We take the minimum cut at each step, and ignore the others. This approach may not always lead to the correct solution, but the results will be fast. The algorithm has cubic time complexity for convex polygons. Checking every edge pair requires quadratic complexity, and for a given edge pair, the algorithm involves calculating area, and doing linear interpolation for finding split lines. For concave polygons, another verification step, that involves ensuring split lines don't intersect with other remaining edges, is needed. This additional step leads to quartic time complexity. 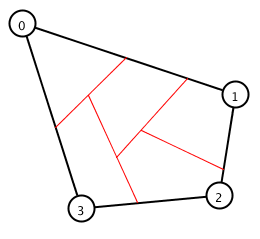 In this approach, we consider every possible split generated by each edge pair at each step, and follow the trail from each split. Because of the recursive nature, the result is always correct, but the time complexity becomes exponential. The recursive approach as outlined above was implemented via processing. The video demo below shows how the split lines change in real time as polygon coordinates or number of required splits is modified. In your n-sided polygon case, the angle-bisector had already intersected with other existing edges, as the red mark. Does that mean I should ignore this angle-bisector, giving up the edge pair(AB&CD) and try another edge pair? MT, Glad you found the post useful. No need to check whether the angle bisector intersects with other edges. It is the minimum cut line that shouldn't intersect with other edges. For a given edge pair, the minimum cut line will either be in the trapezoid (shown in blue) or the triangles (shown in pink). Hope this helps. Great work! For my thesis I'm currently working on the dividing a polygon in known areas (for example you have as input with known order A: 10 m2, B: 14 m2, C: 8 m2). Do you think it is possible to adjust this algorithm to make that possible? Erik, certainly! that would require only a minor tweak to the algorithm. Instead of dividing into equal areas, just specify the known areas, and you should be good to go. That would be very nice! Do you have a github where I could find the code and maybe a paper so I could cite you? 1) How would you determine projection points for an edge pair which would intersect if extended? Especially when edges are perpendicular to each other, e.g. vertical edge where X = 0 to 20 and horizontal edge where Y = 5 to 15. 2) How should we handle cases when some part of e.g. Triangle 1 falls outside of the full polygon being split? Continue calculation based on real (reduced) area or just discard the edge pair? 1a) It is okay for the edges to intersect if they are extended. In-fact you will notice that in above Figures (2 & 3), the edge pair (edges AD & BC) does intersect when extended. 1b) For the specific case that you mention, the minimum cut line won't go through those two edges (X = 0-20 & Y=5-15). While it is certainly possible to split the polygon through those two edges, it won't be the minimum possible length of cut. My solution only covers the *minimum length* of cut. For your example, such a minimum length cut may come from other edge pairs. 2. Re: your point # 2, it is helpful to have some some specific test cases. I would recommend start off with convex polygons first, and when that is working, move to the concave polygons later. The scenario you are mentioning will happen for concave polygons - some of the cut lines found may be outside the polygon and/or intersect with existing edges. So we simply add an additional verification step to ensure that the split lines don't do so. If they do, then we ignore those split lines as a potential solution. 1a) Sorry, I was not clear enough. I meant the case when the intersection point falls on one of the edges. The way I have it implemented currently is displayed in the image. First of all, I create a line 'p' passing through the intersection point X and that is perpendicular to the edge on which we are trying to project the point. If point and edge are on the opposite sides of line p, projection will fall outside of the edge. Maybe there is some smarter way to do this? The algorithm I described first calculates the angle bisector of the edge pair, and then the line p is perpendicular to the angle bisector. Your line 'p' is perpendicular to the line where you are taking the projection. This will not lead to optimal results. Is there a reason, you don't want to take 'p' as perpendicular to the angle bisector of the edge pair? 1b) I think it is possible to construct such a case that the minimum length cut will belong to the pair of perpendicular edges. Maybe the one in the image would be it? If we have a big square (say 100x100) with an extension of a small rectangle (say, of area of 10) and we have to split the polygon into parts of size 15. A good thing is that I think I have an idea how to handle projections for perpendicular edges. For that we have to consider the orientation of both edges. For example, if we are traversing along the ring of the polygon, the bounded are will always lie on the left of each edge (or right, depending on direction of traversal). Let's say we are traversing in the direction of ABCDEF..., then polygon's area is on the left of each edge. Now if we have a pair of perpendicular edges, we can take the direction of both of them (left+left) and that will give us a quadrant. E.g. for AB and FG it would be the AFG one, for AB and DE it would be BED. Then the angle bisector we are interested in will be in that quadrant. And the rest is same as the 1a case. 2) Yeah, if you only had to support convex polygons, it would be much easier Attaching a test case. The idea is that the cut line itself does not necessarily intersect any of the edges or fall outside of the polygon. But parts of the triangles (or even a part of trapezoid) could (e.g. XDE, marked in red). This test case shouldn't be a problem at all with the above algorithm. All XDE does is lead to a negative area, but that is already factored in when you calculate the area of the entire polygon to begin with. For purpose of explanation, I'm going to call the weird jagged polygon shape on the left of AF as J. The min cut line is not just splitting the polygon ABEF in your picture, but it splits the entire polygon, ABCXDEFJA . So the cut line leads to two sub-polygons. One on the left which is A(Cut Line)FJA. and another on the right which is BCXDE(CutLine)B. So, when you calculate the two areas of these two polygons, the negative area of XDE doesn't have any effect. Its hard to talk in hypotheticals, and explain them. I suggest make a real test case with actual dimensions, and see what min cut line you get a result of this algorithm. Keep the test case to the simplest while keeping the negative area of XDE in there. Thanks for sharing, Sumit Khetarpal. That's great Viktor. Thanks for the acknowledement. Hi, can you help me with the interpolated point formula? What does A and G represent? The coordinates of A and G? Thanks for sharing such good topic, and i have some questions confusing me.In my understanding, such an algorithm is a greedy algorithm that it gradually divide the scene into N parts, and in each iteration, only 1/N part is divided. How good is the partition result, especially compared to a global optimal partition? 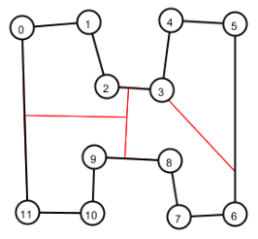 for example, when the polygon is square,i don't think the cut lines is shortest with greedy algorithm.